Cozy Chicks: Cozy Conversation and a Contest! Cozy Conversation and a Contest! We Cozy Chicks love to chat among ourselves. Recently we were talking about our writing spaces and we decided that we should turn this into a fun blog post ... and contest. It's your turn to be an amateur sleuth! As you hear about our desks and our particular clutter or cleanliness, read closely for clues. Each of the desks pictured below belongs to one of the Cozy Chicks. See if you can match up which desk is whose. Then be sure to comment below - those who get them all correct will have their names thrown in a hat and one winner will receive some great cozy swag (so please include your email address!). If no one gets them all right, we'll draw a name from all commenters. How fun is that? See? Added incentive to join in the conversation! We'd love to hear about your desk or workspace, too! your relationship with your writing space? Lorraine: When I think of my writing workspace, there’s only one word to describe it: messy. Julie: Ha! Me too. I truly have a love/hate relationship with my desk. I adore writing here, but despise how messy it gets. It's *crazy* the amount of stuff that collects. Time for me to clear out. Lorraine:When I initially set up my office, I had such good intentions to keep it neat and tidy. The rest of my house is tidy, but not my workspace. The problem is that I don’t have a lot of storage space and I keep ordering bookmarks, postcards, and books. Whenever I tidy one area, another picks up the slack. It was so bad, that for three years I answered my email on my PC and took my laptop into the dining room to write. Kate: Because I have to have a neat desk, the real personality of my workspace lies in the bookshelves behind my desk, where I keep my reference books, cookbooks, CD player, CDs, mementos, photos and meaningful knickknacks. Across from my desk is a bright, cheerful modernistic oil painting, and to my left are big windows that look out onto my backyard and the woods beyond, where I often see deer. 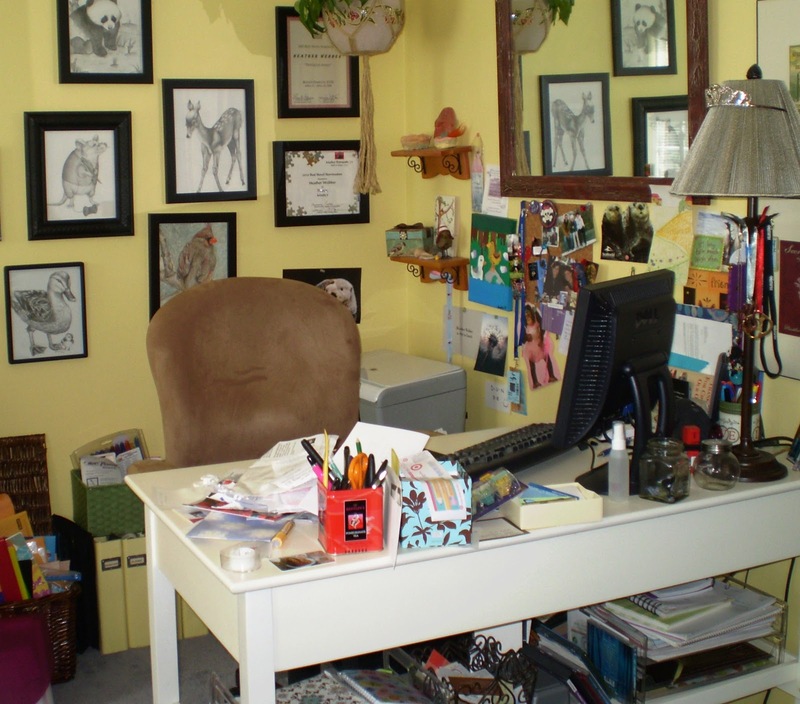 Heather: A few years ago, the “formal living room” was converted into my office. Lots of bookshelves, a cozy chaise, billowy curtains, all my knickknacks... I had grand plans of working in there all day, every day, but as life would have it, I work mostly on my laptop in my favorite chair in the family room. But when I’m on deadline and need to buckle down, I head straight to my desk and my PC (which doesn’t have Internet) and get straight to work. Deadline or no, my desk is always in disarray. 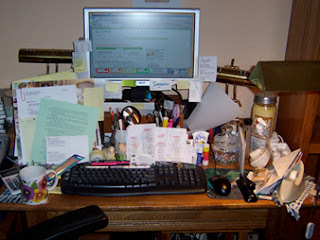 I’m a clutter-bug, but it’s organized chaos—I know precisely where everything is under the mess. 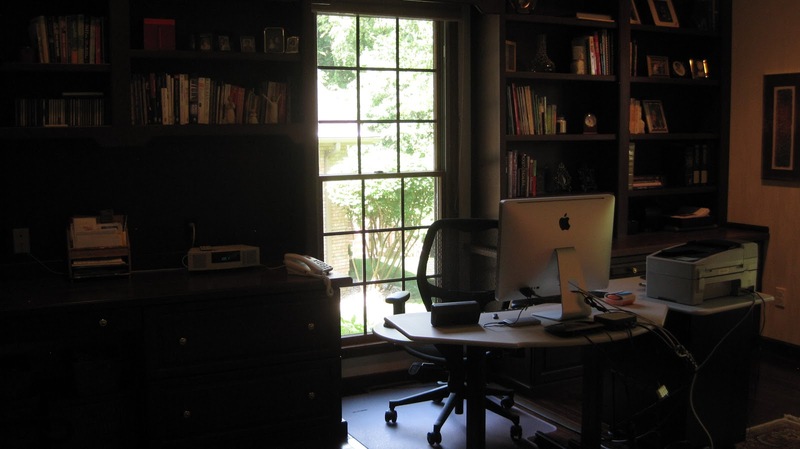 Deb: When my son moved out a few years ago, I finally got my own office (with a view even). I love this space, and find it really conducive to creativity, although it’s almost too comfortable. I social network way too much. 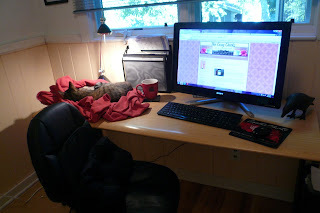 My cat celebrated her seventeenth birthday in August, and she thinks my desk belongs to her. If nothing else, she keeps me organized. I found the crow in a little shop in Kennebunkport. He keeps me in line. Lorraine: What I love most about my office/workspace are the wonderful things I’ve collected over the years to decorate it. Pictures, knick-knacks, and other flotsam and jetsam which I can’t seem to part with. What I’m most proud of is the framed cover for Bookplate Special and the New York Times listing that accompanies it. I was the first Berkley Prime Time author to crack the top 20, and my publisher rewarded me with that gift. Ellery/Jennifer: My desk was my mom's and I've been coveting it for years. It has a really cool history. It's called a Campaign Desk because it comes apart in three pieces in order to be carried on horses or camels. According to the London antique dealer who sold this to my parents a few decades ago, the desk belonged to an officer who fought in the Boer Wars. I hardly made such important decisions on my desk, but I like to think that it's seen quite a bit and now has to deal with me and four cats! Kate: I like my office during the afternoons when the sun streams in, but hate it in the mornings because it's gloomy. I can't write in a cave. If I could change one thing about it, I'd change the orientation to the sun. Because I'm moving in a few months to a new house with a smaller office, it'll be a challenge to make that workspace as convenient as this one. On the plus side, it'll be much sunnier. On the minus side, it'll look out onto the street, not the woods. Julie: Leann, you've just moved. How's that going? How does it affect where you write? 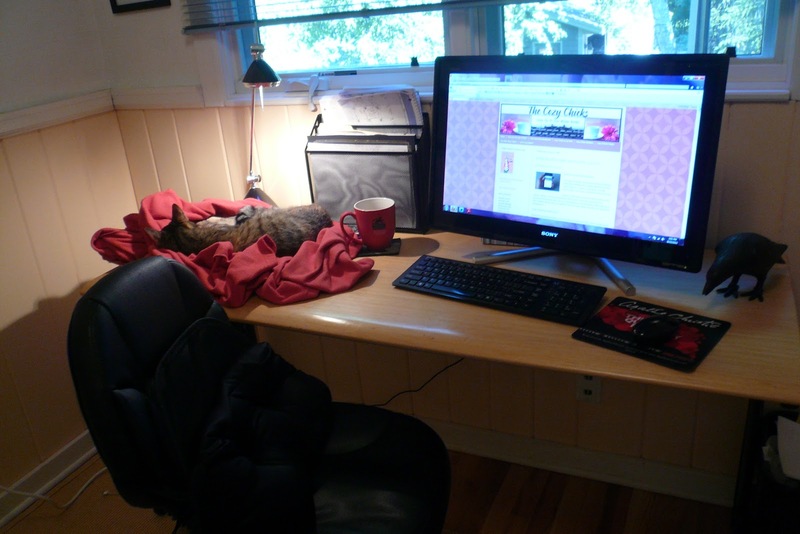 Leann: The photo I submitted is my desk as I now know it. Not too different from the desk I left behind--except there is no space for my research books, my notes, my bottled water, my cortisone cream, my eyeglass cleaner, my latest craft project, my notepads, my ipad ... okay, you get the idea. What I like about this desk? It's comfortable, it's clean and there's room for my cat and my dog. Always good to end on a positive note, right? Maggie: It's a good thing I'm back home in Northern VA, suburbs WashDC, that way I can't send a photo of my messy work area(s) back in my House/home in Colorado. Yes, there are more than one. Now, I move around with my laptop. I'll work beside the living room windows in my rocking chair, on the sofa stretched out, outside relaxed on my chaise lounge in the shade, outside in the front yard in a lawn chair beneath the shady maple tree. And yes---small piles of papers have started appearing on one of the living room end tables. Arrrgh! I'm hopeless! Kate: When I write, I need a cup of tea sitting nearby. I often forget to drink it, but having it there is comforting. I usually write in silence (there's enough chattering taking place in my head) but on the occasion that I need a soothing distraction, I go to my main man Mozart. I've tried other musicians but always find myself gravitating to Wolfgang. I always have to start my writing sessions with ten minutes of Free Cell. It's like having recess before school starts. Julie: For me, I need silence. Complete silence. And a mug of hot coffee first thing in the morning. Kate: My office is the best place to write because I know when I enter the room, I'm at work. 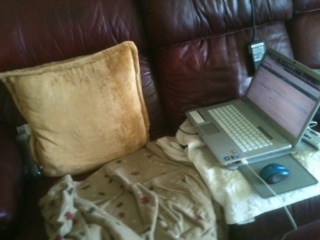 When I use my laptop around the house, I tend to do things like email, shopping, and Facebook. I need the confines of an office to tell my brain "you're at work now, buddy. Shape up! ...You've seen the pictures and heard the stories, now see if you can guess which photo belongs to which author. 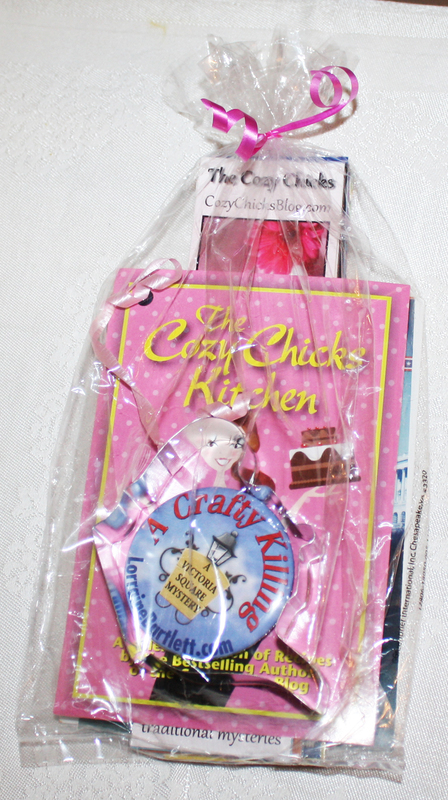 You can win some fun cozy swag!! 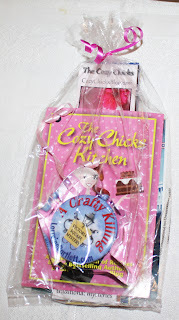 Bookmarks, postcards, a recipe, a button, and a teapot cookie cutter! Don't forget to tell us about your workspace, too. If no one guesses all eight spaces correctly by Wednesday, September 13th, we'll draw names from all commenters. Lorraine will post the winner's name on Thursday, September 14th. Love seeing all the desks! Oops, forgot to read the directions! My email is slatterye at gmail dot com. I'd take a photo of my desk if I could find my camera under all this clutter. I have a small roll top desk which I use only for supplies. Any work I need to do at a desk I do at my my kitchen table. My 'work' desk is cluttered but I can usually fine the file I'm looking forward. My home desk is too buried with filing to find so I'm using the kitchen table now. Thank you for a fun bit of sleuthing! My desk at home is covered with scrapbooking things, and some odd and ends of things. I loved seeing your desks. As for my work space....The desk gets messy at times,I have family photos, some of my owl collection, and books all around it. And a pen holder that always seems to not have any working pens in it! My workspace is always cluttered and has way too much stuff going on... but I do know where everything is, it is organized chaos! I don't really have a workspace right now...my current desk is leaving the house to make way for less clutter. I have a laptop that can take anywhere with me. I love how different all the guesses are! I have no desk and am a wanderer searching for space the teens or 5 year old haven't claimed! I will leave the guessing to others, I just have to say-- As an author/graduate student just starting out I am insanely, ridiculously jealous of the gorgeous, peaceful spaces most of you are writing from. They look like the belong in the books rather then this world. A--Heather; B--Deb; C--Maggie; D--Leann; E--Lorraine; F--Kate; G--Julie; H--Ellery/Jennifer. That was fun. Thanks for letting me get some sleuthing practice in! As for my desk, lately it's been the kitchen table or couch!